[prMac.com] Seattle, WA - January 1, 2008 - BusyMac today announced BusySync 1.5, a free upgrade to its calendar sharing utility that now supports synching over the Internet, in addition to its previous support for synching over a local area network. BusySync now allows users to sync iCal calendars between their home and office computers, or with users at remote locations, while also syncing with family or coworkers on their local area network. 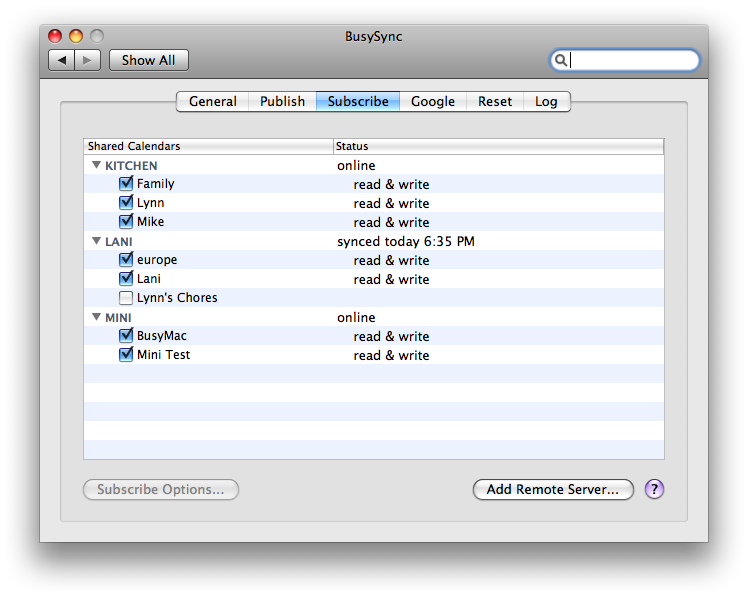 BusySync is a Mac OS X System Preference Pane that runs in the background and adds calendar sharing capabilities to iCal. Designed for families and small workgroups, BusySync allows users to easily and cost-effectively share iCal calendars on a local area network and over the internet without the need for a dedicated server. Shared calendars can be viewed and edited by multiple users and changes are instantly synchronized between users. Bonjour Networking: Shared calendars are automatically detected and synchronized over a LAN without the need for a dedicated server. Wide-area-networking: Calendars can be shared over the internet between home and work or with users at remote locations. Multi-User Editing: Shared calendars can be viewed and edited by multiple users, and calendar updates are synchronized instantly. Security: Calendars can be password protected to provide read/write or read-only access, and data transferred over the network can be SSL encrypted. Offline Access: Changes made to a shared calendar while disconnected from the network are automatically synchronized when reconnected. BusySync 1.5 is available now for $19.95 per user. Multi-unit discounts are available. Based in Seattle, Washington, BusyMac is a privately-held company founded in 2007 by Dave Riggle and John Chaffee. Dave and John have a long history of developing great software together, dating back to the early 90's when they created Now Up-to-Date, a revolutionary network calendar for Mac OS 7.